Craig Biggio's career is one marked by consistency, not dominance. Alongside Jeff Bagwell, he was the face of the Astros franchise for two decades. And while he is beloved and respected by many, Craig Biggio cards don't have the sizzle of a lot of other players. That's what happens when you're known more for singles and doubles than dramatic home runs. Biggio spent his entire career with the Astros. He was a seven-time All-Star and winner of four Gold Gloves. He finished with 3,060 hits. The first Craig Biggio cards can be found in a pair of late-season box sets, 1988 Fleer Update and 1988 Score Rookie/Traded. Both are readily available and extremely inexpensive. Both sets also have Glossy versions. The Fleer Glossy card doesn't carry much of a premium. 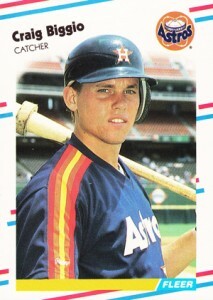 However, the 1988 Score Rookie/Traded Glossy Craig Biggio is quite rare and is his most valuable early card. It is worth noting that some people consider these cards to be XRC, or pre-rookies. As a result, many label Biggio's 1989 base cards as rookie cards. Because his rookie cards come from an era of massive print runs, collectors may want to look to Craig Biggio autographed cards as a better investment opportunity. To this point, he is a fairly tough signature to find. While he has signed for several sets over the years, supply has largely dried up. Likewise, autographed memorabilia is relatively rare. It's out there, but not in huge numbers. 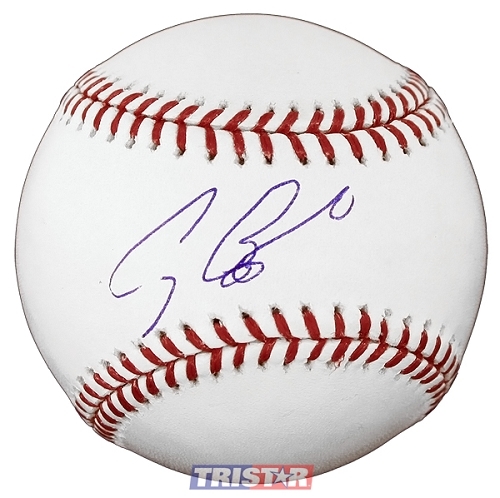 Now that Craig Biggio has been elected to the Hall of Fame, look for his autographs and other cards to get a second life. There likely won't be a huge jump on the cardboard side, but there will be sustained demand, especially for signed memorabilia. Bolstered by a nice photo, the 1988 Fleer Update Craig Biggio can be found for very little money. Because they're so cheap, collectors may want to look to high-grade versions as they too are relatively cheap. There is also a Glossy version of the card, similar to Topps Tiffany sets. However, because of its massive print run, it remains cheap. 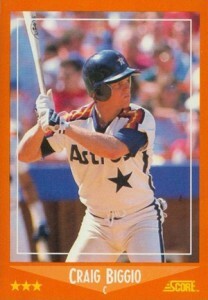 Like the Fleer Update card, a huge supply means that the 1988 Score Rookie/Traded Craig Biggio remains a bargain. From an investment perspective, collectors may want to look for the Glossy version that is easily his most costly 1988 card due to its rarity. 1988 SCORE CRAIG BIGGIO #103T ROOKIE CARD HOUSTON ASTROS HOF NM-MINT SWEET! 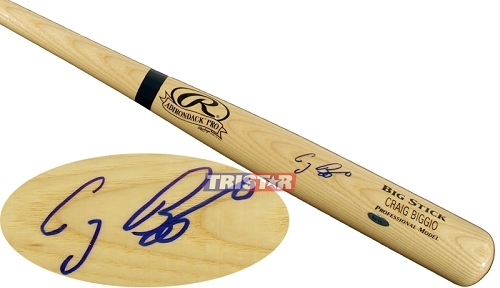 Below you will find an example of what Craig Biggio's authentic signature looks like. This can be used as a first point of reference for determining the legitimacy of autograph memorabilia, but is not a substitute for having your items authenticated by a well-respected professional autograph authentication company. Some of the trusted sources within the sports memorabilia market include the following companies: PSA, JSA, Steiner, Tristar and Mounted Memories. Click on any of the images below to view full size photos. The signature is written with a right lean on a slight slant of about 20 degrees. The first letter is a combination of "C-g", it contains a down stroke at the top of the "C" and a long tail coming of the bottom of the "C" for the letter "g."
The letter "B" is distinct it is closed on all sides and resembles a finger pointing. Coming off the "B" is a scribble of circles implied to be "i-g-g-i." An extending line connects the least letter, a discernible "o."